I’m sure a psychologist would have a lot to say about Rocky Road being the recipe of choice post move. I had high hopes of stock piling recipe posts so that I could seamlessly blog away this past month despite the near breakdowns, running out of bubble wrap, learning to disconnect fridge freezers from junction boxes, house buyer gazumping and generally enduring one of the most stressful times in my life. I’m pretty sure I’ve come out the other side addicted to sugar yet somehow lighter and before I try to ween myself off the white stuff thought I’d have one last hurrah. It is also a recipe that requires next to no equipment or technical ability so seemed the perfect thing the christen the new kitchen. To Nigella’s recipe I added hazelnuts and raisins and swapped the rich tea biscuits for digestives. Heat the butter, chocolate and golden syrup in a heavy-based saucepan over a gentle heat. Remove from the heat, scoop out about 125ml of the melted mixture and set aside in a bowl. Fold the biscuit pieces and crumbs into the melted chocolate mixture in the saucepan, then add the marshmallows, hazelnuts and raisins. Tip the mixture into a 20cm/8in square baking tin and smooth the top with a wet spatula. Pour over the reserved 125ml of the melted chocolate mixture and smooth the top with a wet spatula. To serve, cut into 20 squares and dust with icing sugar. Hi Emma I’m sorry I only just saw your post on the choc macaroons . ! The pictures look great! 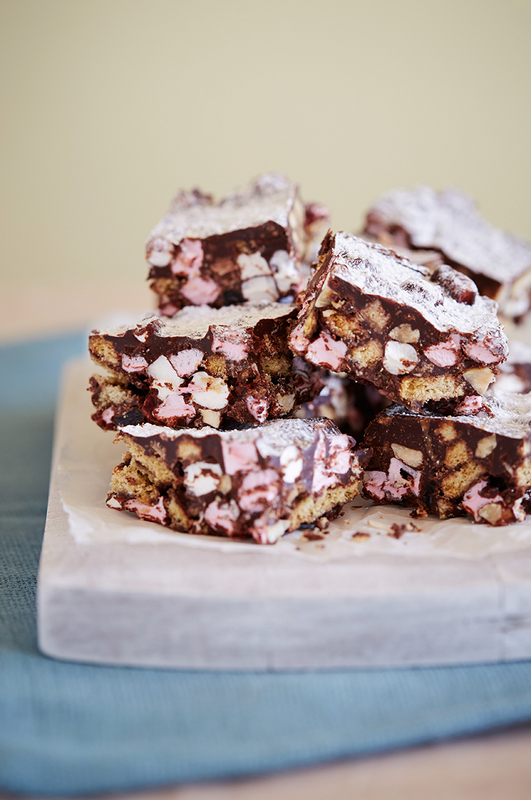 I have never made a proper version of Rocky Road, but yours looks beyond amazing! Thanks so much. Alas Nigella Lawson gets the credit for these. I just tinkered with her recipe! That does look very good, Emma….I’m very tempted to make these for the grand children. It was divine! Maybe use 50-60% dark choc for little ones and remember to hand them back shortly after consumption but before the sugar kicks in!